The B1-253SP is one of the best selling biological microscopes with excellent optical and mechanical performance. 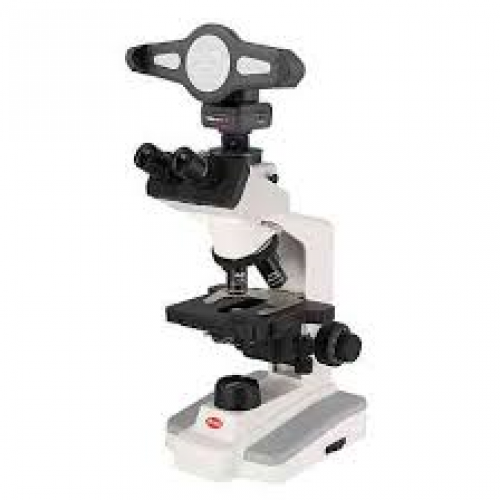 Trinocular head microscope 45 degrees inclined 360 degrees rotatable. Total 1000x magnification.Wide field 10x/18mm eyepieces. Reversed quadruple nose piece. Semi plan Achromatic Objectives. 4x,10x,40x(S), 100x (S) provide improved flatness over the field of view. Coaxial coarse and fine focusing, built in coaxial mechanical stage, NA 1.25 Abbe condensor.Iris diaphram, LED illumination with intensity control delivers a safe, bright and long lifetime light source. Download the Moticonnect app and run images to your own platform or install the software in your PC to multiple devices. Connection: WiFi/USB. Power AC Adaptor. Platform: Android/IOS. Lens mount C mount.